The Duke of Mecklenburg ordered Pastors to submit Registers of their communicant members in 1751. 190 churches listed their confessing members. The original handwritten reports are in the State Archives in Schwerin, and the transcriptions of the records are printed in the eleven books by Franz Schubert. The reports show occupation, names of all individuals in the household 14-15 years or older, and their relationship to the family. The Salt Lake FHC has these books as well as some big university libraries (like Harvard) or other genealogical libraries. This page shows the records from two churches in 1751. This will give you an idea of what is available. Occupations are shown such as: Müller = miller, Hollander = dairyman, LehrJ. = apprentice, Kuhhirt = cowherder, Schaefer = sheepherder, Hofhacker = farmland worker or vinegrower, Halbhüfner = half share farmer, Hüfner = farmer, Schultze = village mayor, Pfarre = pastor, Küster = sexton or parish clerk, Schmied = blacksmith, Schulmeister = schoolmaster, Einlieger = farm laborer without land, Droscher = driver, Bauer = farmer. Abbreviations used are E. (Ehefrau) wife, T. (Tochter) daughter, Wwe. (Witwe) widow, S. (Sohn) son, StS. stepson, K. (Knecht) servant, D. (Dienerin) domestic maid, J. (Junge) boy. Zu der Cladrumschen Gemeine gehören 4 Dörfer, als Cladrum, Grabow, Zölckow, diese liegen in der Lübzer Vogtey, das vierte heißt Badegow und ist adelig, nach Bülow dem Herrn Magnus Fried. v. Barnern zugehörig. Translated: In the Kladrum parish, there are four villages that belong - Kladrum, Grabow, Zölckow; these are situated in the Lübz jurisdiction. The fourth village is Badegow and this belongs to Master Magnus Friedrick von Barner, its nobleman, who lives near Bülow. Chrn. ZARN, E: Ann Trin Bornhöften, StS: Hartw. Föltzer, StT: Trien F.
Bauer Carl NIEMANN, E: Ölgard Gädtchen, StS: Hans Joch. Wilcke, StT: Ilsch W.
Bauer Pagel JACOBSEN, E: Dor. Mauwen, S: Joch. David, Sf: Ann Ilsche Bossowen, S: Fried., T: Lise, J: Hans Suckow, D: N.N. Droescher Hans Joch. KOEPCKE, E: Maria Leonhardts, T: Dor. At the end of the census for the parish of Kladrum, the pastor lists "Die Anzahl der Beichtkinder (the number of communicant members)" in each of the towns in the parish. The total is then shown as 286. Bauer Joc. ARNS, E, Bruder/K: Chrn. Die Einlieger mit ihren Frauen:. This baroque-style castle at Bülow was originally constructed in 1746 over the cellar of an old manorhouse. The exterior was completely redone in 1842. Flat- topped towers, one storey high, rise at all four corners. The baroque banquet hall is on the upper storey. Stucco and marble pillars and painted stucco-relief pictures with rural themes decorate the hall. The entry on the ground floor is to one side. The ceiling in the vestibul is made of inlaid paneling and wainscoting from the middle 19th century. 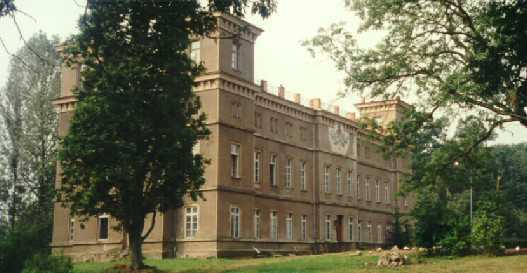 The castle was converted to apartments and administrative offices during the Soviet era of East Germany.